Thursday, DoN and Art Friends Alden Cole, Shoshana Aron and Aida Berzins attended the opening of Color, Spirit, Innovation: The Art of Sam Maitin – Selections from a Fifty Year Career atThe Art Institute of Philadelphia, 1622 Chestnut Gallery. 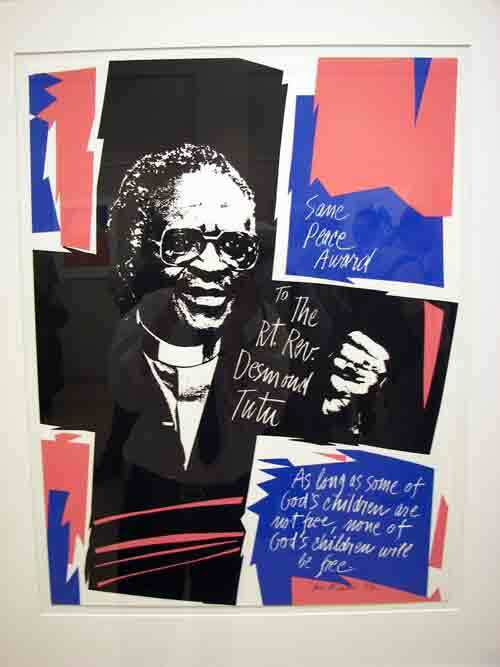 Curated by Sam’s wife and artist Bob Jackson, the party was well attended by friends, family and admirers to celebrate the brilliant career of one of Philadelphia’s favorite artists and teachers. 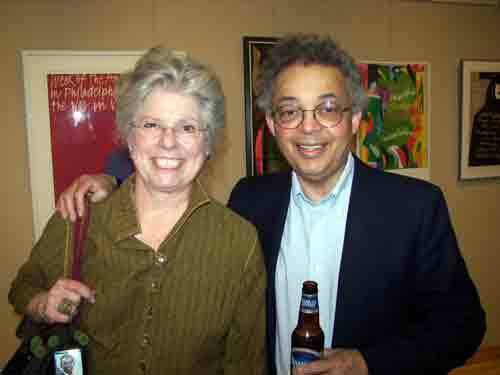 Maitin was a modern renaissance man working in mixed media, intent on sending messages, encoding his work with symbolism and speaking out against injustices like the war (Viet Nam that is), rascism (Aparteid that is) and volunteering his talents to various Philadelphia institutions (like The Philadelphia Theater company). Maitin’s art work helped define the modern visual landscapes of the city of Philadelphia (art card). Co-curator Bob Jackson credits Maitin with his own artistic breakthrough and now leads a weekly workshop at The Plastic Club – the legacy lives on. 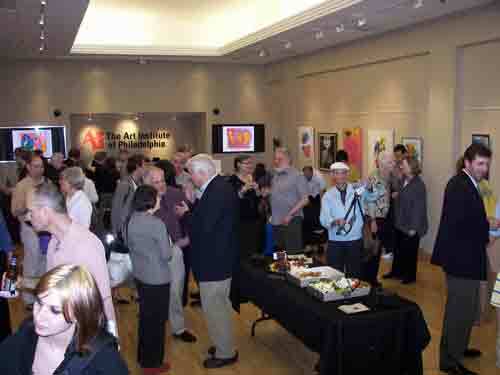 Art opening celebrating the career of Sam Maitin @ The Art Institute of Philadephia Gallery. Mixed media by Sam Maitin @ The Art Institute. 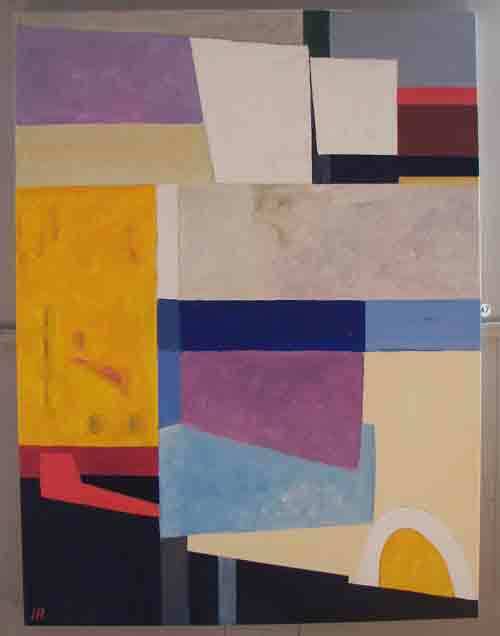 This piece is from the 1960s by Sam Maitin. 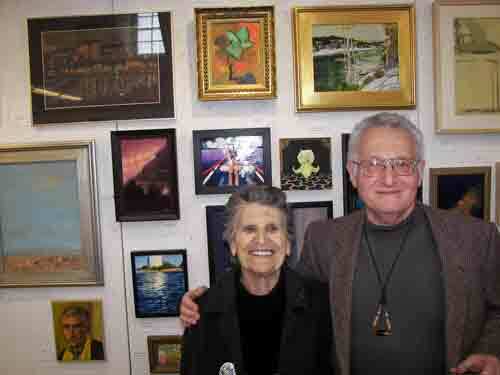 Phyllis & Bob Jackson (co-curator) @ Sam Maitin retrospective opening party. 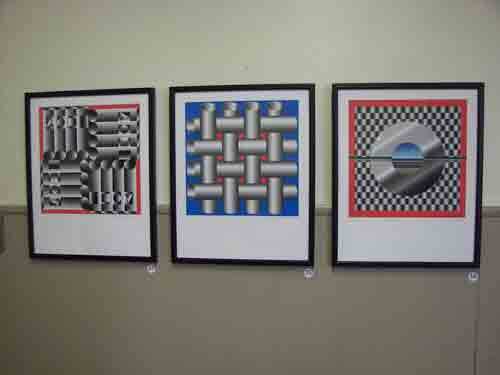 The Sam Maitin exhibit is up through May 30th. This entry was posted in Ceramics & Sculpture, Design, DoNBrewer, Multimedia Art, Philadelphia, Philadelphia Art, Philadelphia Art Shows, Philadelphia Artists, Photography Philadelphia, Uncategorized on April 29, 2008 by admin1. DoN LoVes Stango; I purchased one his Marilyns when I lived in Manayunk more than a decade ago. 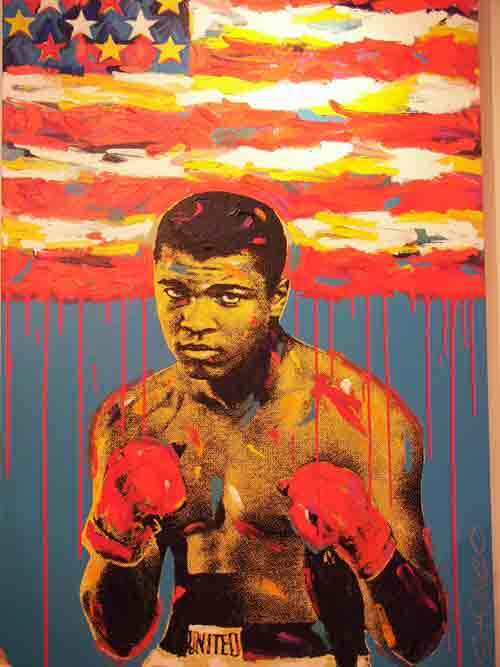 Since then Stango has stuck to his guns and continues to produce bold, colorful paintings incorporating iconic images of movie stars, pop icons and famous logos which provoke, amuse and sometimes upset viewers. John Stango has been compared to Warhol and Peter Max but as Picasso said,”Good artists copy;great artists steal.” Lately he has been producing giclee prints which he customizes. 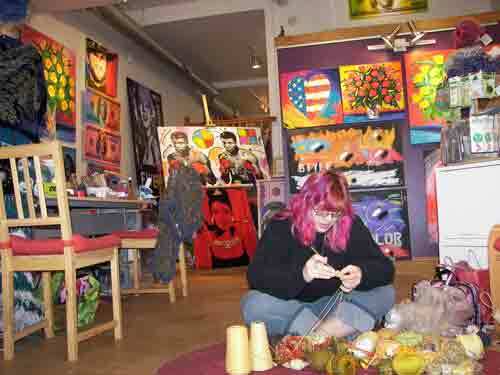 Stango is exclusively represented in Philadelphia by Nangellini, 832 South Street; proprietor Nancy (who is a fiber artist creating groovy knit caps and hats, scarves and shawls, even a crocheted wedding dress under which the bride wore a bikini) presides over the colorful collection of Elvis’, Marilyn’s and Chanel’s. Nancy knitted while chatting with DoN about maintaining a shop on South Street, taking on the job of representing Stango so he could spend time painting and having an outlet for her own creative pursuits as a fiber artist. Nangellini is fun and inspiring to visit and an easy place to shop for sumpin’ funky. 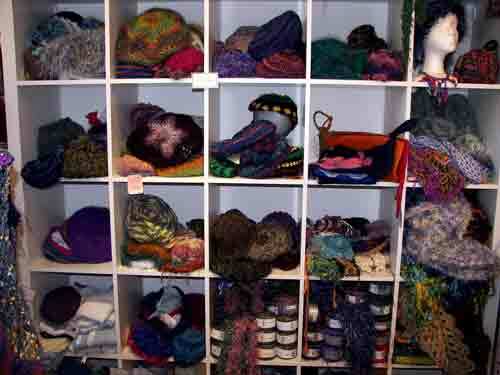 Knitted hat selection @ Nangellini on South Street. Painting by John Stango @ Nangellini. This entry was posted in Ceramics & Sculpture, Design, DoNBrewer, Fabric Art, Multimedia Art, Philadelphia, Philadelphia Art, Philadelphia Art Clubs, Philadelphia Art Shows, Philadelphia Artists, Photography Philadelphia, Uncategorized on April 23, 2008 by admin1. Second Thursdays at the Crane Arts Building are off the hook; located at 1400 N American St. · Philadelphia, PA 19122-3803, there is ample parking and always excellent art. At the Nexus Gallery, two artists are showing works on paper; Tasha Doremus: New Work and Susan Abrams: From Stillness. Doremus’ work somehow mixes photography, computer graphics and surface destruction to create images at once emotional and thought-provoking; one image reminded DoN of when he was a kid and the film would sometimes melt at the movies and the projector would have to be stopped and the film edited back together. In fact, one of her pieces has slashes in the paper revealing a glimpse of crimson hidden beneath. Artist, Tasha Doremus @ Nexus Gallery. Susan Abrams’ “from stillness” is a collection of photographs and prints with unusual distinction, hand-made paper is printed with images of corrosion, water damage and entropy. All of the images are printed on paper made from abaca pulp (derived from banana plants) and were digitally printed in collaboration with Rick De Coyte of Silicon Gallery Fine Art Prints. (Nexus Website) DoN believes this is a bold artistic statement considering the technical difficulty of feeding rough hewn paper through a printer with the inherent risks. 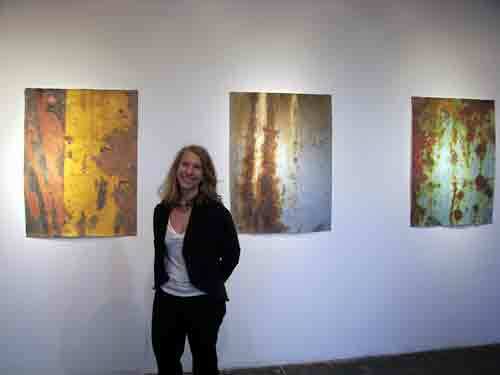 Artist, Susan Abrams @ Nexus Gallery. In the Icebox the future is on view; a fantastic motion graphics project utilizing five projectors creating a dystopian universe of animal totems, post-apocalyptic destruction and dizzying sound design. Many visitors sat on the floor transfixed watching The Soft Epic or: Savages of the Pacific West by Nadia Hironaka and Matthew Suib. Birds, cats and fire cross through the projections like a crazy quilt of spiritual images; the technical accomplishment is dazzling. The Soft Epic @ the Icebox. Composite photo by Alden Cole. 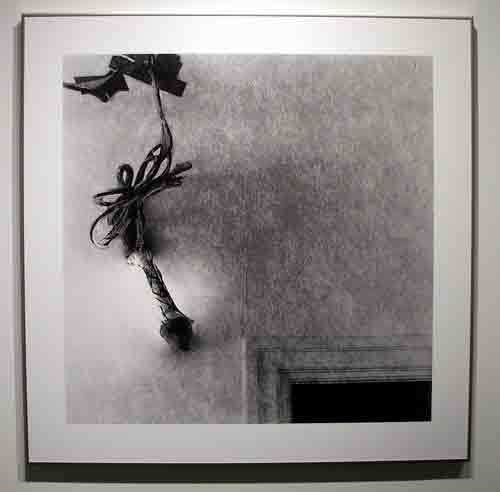 On the second floor is 201 Gallery with a spot-on show of large scale photographs by Ryan Widger; black and white prints fill the space with shadowy compositions evoking loneliness, contemplation and magic realism appropriately titled Consummated. 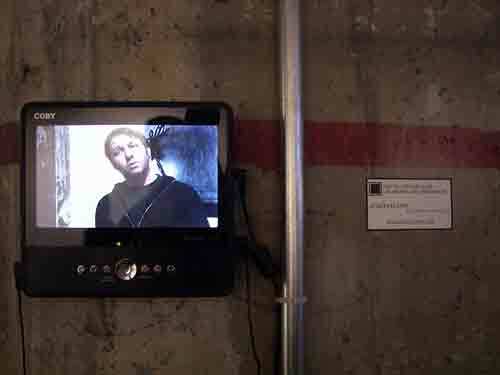 The gallery also features a new video display created by StudioScopic enabling the gallery-goer to virtually visit the artists’ studio. Photograph by Ryan Widger @ K&W 201 Gallery. Video display by StudioScopic @ K&W/201 Gallery. 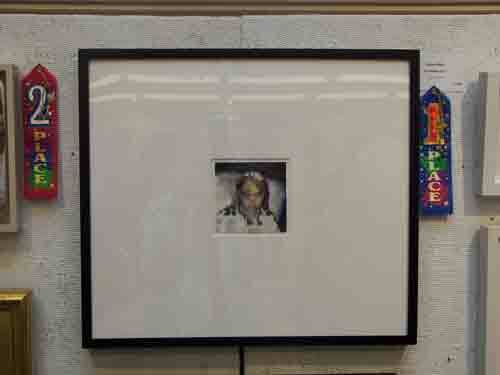 This entry was posted in Design, DoNBrewer, Multimedia Art, Philadelphia, Philadelphia Art, Philadelphia Art Shows, Photography Philadelphia, Uncategorized on April 16, 2008 by admin1. 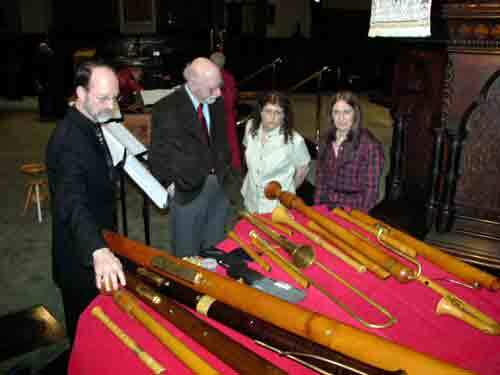 Bob Weimken explains the ancient instruments to concert goers. One of the best parts of a Piffaro concert is the chance to get up close and personal with the musicians and the instruments. The concert at the Lutheran Church was so eclectic and some of the sounds!?! DoN loves it when the tones seem to go atonal or somehow off but really are a transition to a new musical experience somehow transported out of ancient history. Piffaro is truly a unique experience, like seeing a rock band such as the B52s with girl singers and crazy instruments but from out of the distant past. Time travel is possible. This entry was posted in Ceramics & Sculpture, Design, DoNBrewer, Multimedia Art, Philadelphia, Philadelphia Art, Philadelphia Art Shows, Uncategorized on April 9, 2008 by admin1. 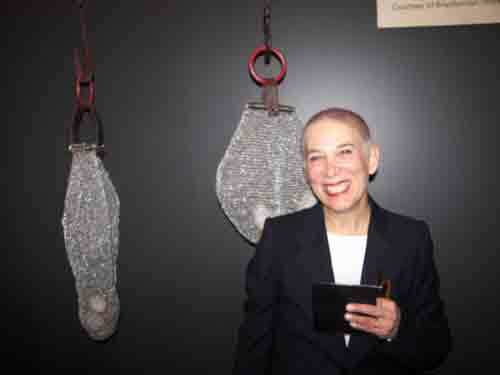 After the lecture DoN and artist Aida Berzins zipped over to the Philadelphia Society of Free Letts’ Celebrating Latvian Arts show. Berzins was represented with five works but was joined by an impressive array of fine art from paintings, photography, digital design and sculpture all by Latvian artists. Latvia (historically Lettonia, or Lettland), officially the Republic of Latvia, is a country in Northern Europe. Latvia shares land borders with Estonia to the north, Lithuania to the south – and both Russia and Belarus to the east. It is separated from Sweden in the west by the Baltic Sea. The capital of Latvia is Riga (Latvian: Riga). Latvia has been a member state of the European Union since May 1, 2004 and a member of NATO since March 29, 2004. 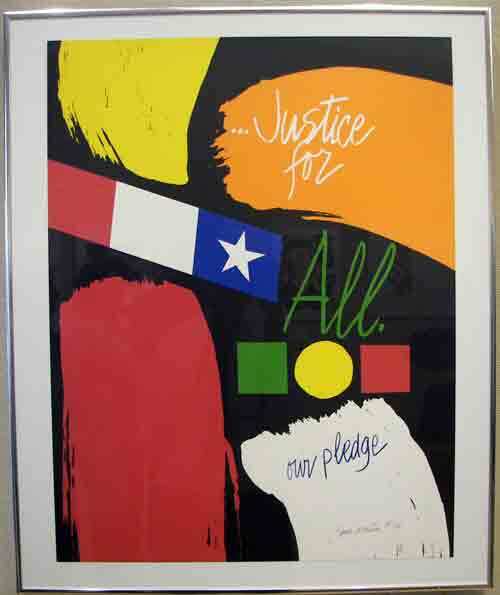 Read the Wikipedia article to see why so many Letts emigrated to America, Aida spent many years in a German refugee camp as a child before moving to the U.S.
Berzins’ artwork is a result of faithfully pursuing her passion and is quite prolific and well respected in the Philadelphia arts community. 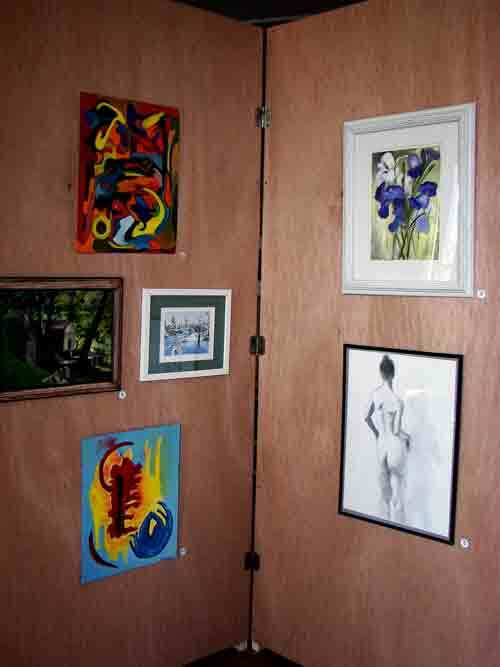 Drawings and paintings by Aida Berzins and Ugis Nigals @ the Latvian Society. Acylic painting by Ilmars Rumpeters @ the Latvian Society. 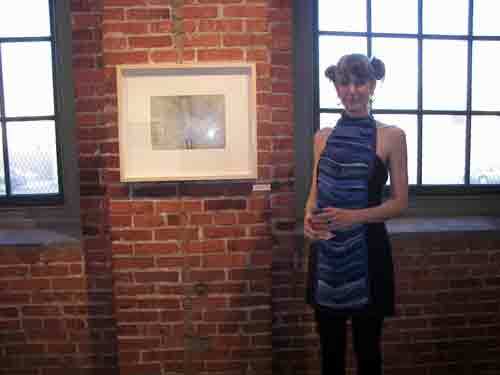 Digital art by Ugis Nigals @ the Latvian Society.Sunday, DoN and art enthusiast/couturier Shoshana Aron attended the opening of the Philadelphia Sketch Club’s prestigious 145th Annual Small Oil Paintings Show. The show is an eclectic mix of landscapes, still life, abstraction, atmospheric naturalism, impressionism, portraits and more – a fine example of the work by Philadelphia’s best painters. DoN is honored to be included in such good company. 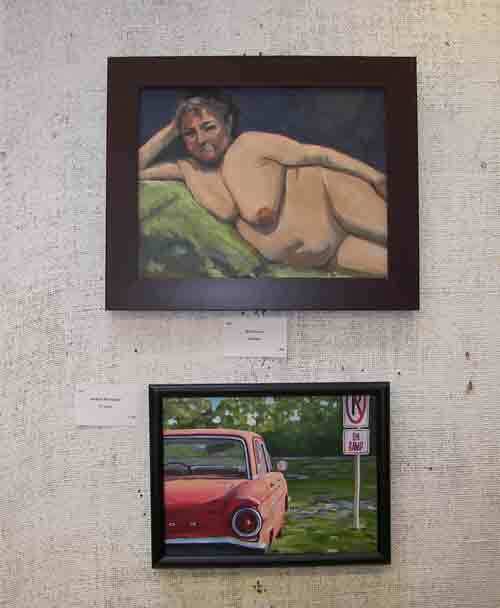 DoN Brewer’s Odalisque and Richard Harrington’s ’62 Falcon @ PSC. 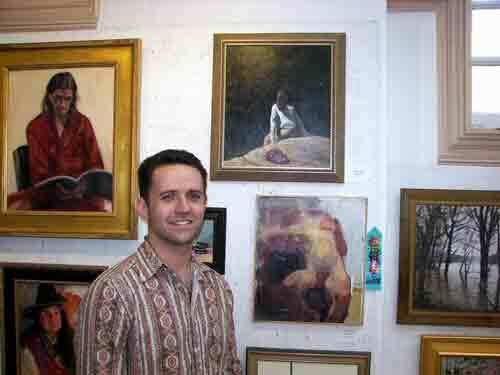 Artist Kyle Margiotta with his entry (top center) @ PSC’s 145th Small Oil Paintings Show. Arthur Ostroff with Pearl Garper (Arthur’s entry is upper left) @ PSC opening. First Prize Winner, Allison Miller @ PSC Small Oil Paintings Show. The First Prize winner, Allison Miller’s, The Domino Effect is a moving, expressive minimalist piece with the pentimenti of the drawing clearly visible causing an emotional reaction to the viewer especially in this modern age with so much violence in our culture. This show is a must see art event through April 27th. DoN and Shoshana left the party early to attend the Artek and Piffaro, the Renaissance Wind Band’s A Musical Pastiche from Early 17th Century Germany concert at the Lutheran Church, 2110 Chestnut Street. Artek and Piffaro are both early music ensembles and the combination of voices, early instruments such as recorders, shawms, sackbuts, dulcians and even a hurdy-gurdy was exquisite and transcendent. From dark pieces such as Alma Afflitta (a diddy about aflicted souls) to Mirtillo hat ein Schafelein ( a song about a sheep who needs a spoon of potion so she could calm down to be sheared) the afternoon concert was deeply affecting and rewarded by a standing ovation. 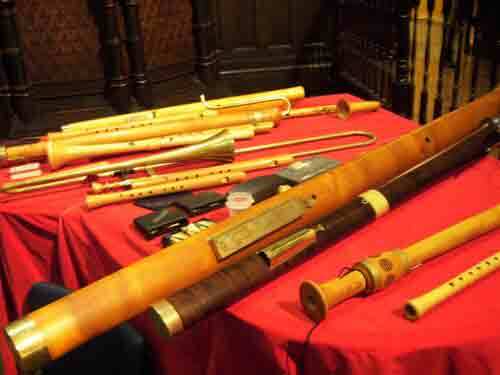 Piffaro’s wind instruments on display at intermission. DoN would like to make a correction to an earlier post regarding the work of Leslie Pontz and Ruth Borgenicht recently on view at the Crane Arts Center; the collaborators are represented by Snyderman-Works Gallery, 303 Cherry Street, Philadelphia. All photos by DoNBrewerMultimedia Photography except where noted, all rights reserved. This entry was posted in Ceramics & Sculpture, Design, DoNBrewer, Fabric Art, Multimedia Art, Philadelphia, Philadelphia Art, Philadelphia Art Shows, Photography Philadelphia, Pottery, Uncategorized on April 8, 2008 by admin1.